VEDASTE'S BANANA GROVE IS NOW SO FRUITFUL, THE TREES NEED SUPPORTS TO KEEP FROM FALLING. Dusabimana Vedaste, 44, is a skilled Rwandan farmer who can proudly say that he has always provided for his wife and six children. But poor quality of seeds and unpredictability of climate limited the quantity of food that he could produce. FH is walking with Vedaste’s community of Busekera to improve the living standards for all the families there through integrated and child-focused, transformational development. That’s a fancy way of saying FH works with the community to understand what all needs help, ultimately helping its kids. The Vedaste family is one example of how powerful change can be, once it begins. After Vedaste enrolled in the program in 2011, he learned about farming methods like using new tools, organic fertilizers, resting his land, and mulching. He even received inputs like weather resistant seeds that help ensure the success of his crops. Another factor that increased harvest: pigs! FH staff was able to provide 22 pigs to 22 families in 2015, thanks to the generosity of donors. And those families who have been given swine in the past are able to teach their neighbours about breeding. These families are also good role models when it comes to making the most of the manure. 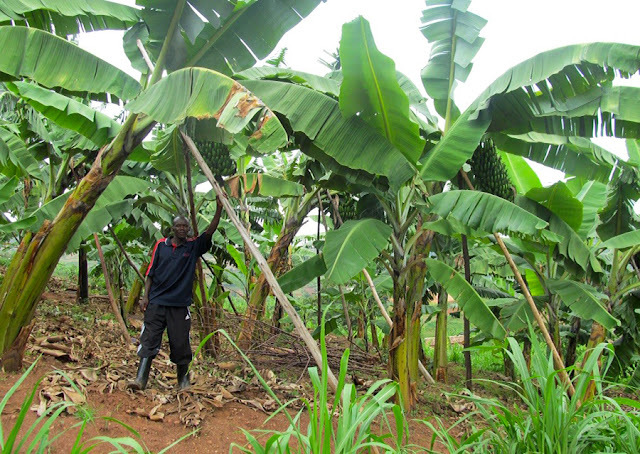 Rwanda’s acidic soil can make or break a harvest season for farmers, and the proper use of manure has done a lot to increase rates of success. The pigs have done wonders for Vedaste’s family, and not only as providers of manure. Some of their little piglets go to market and provide income while the family waits for the banana harvest. A good harvest - like Vedaste’s banana crop, where ten times as much fruit was produced - makes all the difference to families in Busekera.